A civil ceremony is one that is officiated by someone who is not representing a religious faith. These ceremonies are performed by civil servants, most often a judge. In some states, the power of authority can be granted to relatives or others to act as officiant. If you like that Idea, you need to check with your Clerk of Court's office to find out what needs to be done to deem someone able to perform the wedding. Some civil ceremonies take place at the same location you purchase your marriage license, while others take place in wonderful venues. The location of the wedding is entirely up to you. Invitations for a civil ceremony are no different than those of any other wedding. Many couples choose to not have any guest other than their very close family or a few friends. Some elope. So, you see it's up to you and your soon to be spouse to decide what's right for you. If you do decide to send out invitations you might want to check out the links below for some inexpensive, but nice ones. The following is an example of the reading at a civil ceremony. The text is changed a little from the copy of it in, "How to Have and Elegant Wedding for $5000 or Less". Family and Friends, we are gathered together in the presence of these witnesses to join _______and_______in matrimony. Marriage is not to be entered into lightly or unadvisedly, but discreetly, soberly, and with love. Your wedding is a beautiful beginning to a liftime of love. It is family and friends gathering to share in the glad celebration of two people beginning a future they are both dreaming of. It is the making of vows, the exchange of rings and the giving of a kiss; yet more than this, it is a promise fulfilled, a dream that's come true, and the first happy step in a life shared by two. It is a time to be treasured the rest of your life; it's that wonderful moment you become husband and wife. A good marriage must be created. In the art of marriage, the little things are the big things. It is remembering to say, "I love you" at least once each day. Remember home is built. If the solemn vows that you are about to accept are kept, and if you steadfastly endeavor to lead honorable and worthwhile lives, the home that you establish will abide in peace and the marriage will be lasting. No other human ties are more tender, or vows more sacred, than those that you are now about to assume. Please join your hands and face one another. Will you_______have________to be your wife, to love, honor, and cherish her so long as you both shall live? Will you ______have________to be your husband, to love, honor, and cherish him so long as you both shall live? Place the ring on her finger and repeat after me: With this ring as a symbol of my love, I take you as my wife. Place the ring on his finger and repeat after me: With this ring as a symbol of my love, I take you as my husband. 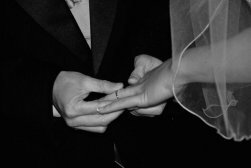 The ring is a symbol of your marriage, symbolic of the fact that you have this day pledged yourselves in marriage, and as the ring is a perfect circle without end, it is the wish and hope of all that your marriage will be perfect and will be without end. And now, inasmuch as_______and ______have consented together in wedlock and have vowed before these witnesses, and thereto have pledged to each other, and have declared the same by joining hands, and in the giving of rings, by the power of the authority vested in me by the state of _______, I now pronounce you husband and wife. You may kiss the bride. Ladies and gentlemen, I proudly present to you Mr. and Mrs. __________________. Here's an example of a civil wedding in the lobby of a courthouse. Some resorts like the one below offer weddings and honeymoon packages all in one. This would be a nice way to "kill two birds with one stone". Have A Great Tip or Idea? Do you have a great tip or idea about wedding planning? Share it! Do you have a great wedding story? Share your wedding planning story with us, we'd love to hear it!